Is a brick wall blocking your spiritual path? Is a barrier of fear, lack, sickness, or anxiety hindering your vision of heavenly possibilities? Then it’s time to reach up and receive the power for a supernatural breakthrough so you can move forward into the blessings on the other side. 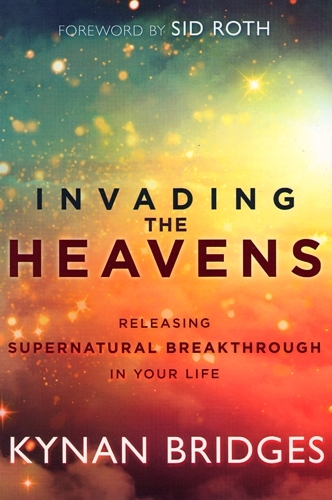 Invading the heavens describes miraculous, faith-building breakthroughs. But it dies much more than that, presenting a full picture for attaining them yourself, including the conditions and process of breakthroughs – from positioning yourself under an open heaven to overcoming the spirit of prevention and understanding the laws of manifestation. Believe you live under an open heaven. Press into the promises of God. Avoid the roadblocks of the devil. Do the impossible with faith in Gods possible. Don’t stay stymied for a minute longer. It is God’s will for you to receive what He has promised you. Break through to the life you’ve been waiting for! Chapter 13: No More Delay! Anyone looking for a genuine supernatural breakthrough – in any area of their lives – should read this book. His first chapter is called Anatomy of a Breakthrough, and the whole book unfolds the various features of the divine plan for accessing heavenly freedom and blessings. With wisdom, humor and clear illustrations, Kynan explains what a breakthrough is and how to position yourself to receive one, as you live from God’s presence 24/7. The open heavens are available to all believers – but an open heaven demands an open earth. This book shows how to break through the barriers and hindrances in your life to receive all that you heavenly Father has promised you. Dr. Kynan Bridges has managed to write another must-read book! 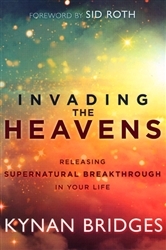 Invading the Heavens provides rich insight into the realm of breakthrough. It is vital that every believer understand the breaker anointing and the supernatural power to advance far beyond the artificial limits that the enemy tries to place on their lives. This book will build the faith of the reader and release supernatural power to break loose and break free! Dr. Kynan T. Bridges is the senior pastor of Grace & Peace Global Fellowship in Tampa, Florida. God has placed on Dr. Bridges a peculiar anointing for understanding and teaching the Scriptures, along with the gifts of prophecy and healing. Dr. Bridges and his wife, Gloria, through an apostolic anointing, are committed to equipping the body of Christ to live in the supernatural every day and to fulfill the Great Commission. A highly sought-after speaker and published author of several books, including Kingdom Authority, The Power of Prophetic Prayer and Unmasking the Accuser, Dr. Bridges is also a committed husband, a mentor, and a father of five beautiful children: Ella, Naomi, Isaac, Israel, and Anna.